I am usually pretty spot on with movie award nominations (and winners) but this year has been all over the place with no single film standing out for the masses. As there are so many good books that get overlooked, there are also so many good movies who suffer the same anonymity, especially in the flare of blockbusters. One that sticks out is the 2014 film , Calvary, starring Brendan Gleeson (remember Hamish from Braveheart? ), Chris O’Dowd (Bridesmaids), and Kelly Reilly (Flight). It is an Irish-made film by the talented director, John Michael McDonagh. I watched it in theater last year and then again this past week at home. I have always had an affinity toward Irish films like The Commitments, Waking Ned Devine, Michael Connolly, In the Name of the Father, Bloody Sunday, and Once. There is something about the unique dry humor in Irish films as well as their ability to hit some of the deepest emotional themes in life through storytelling. 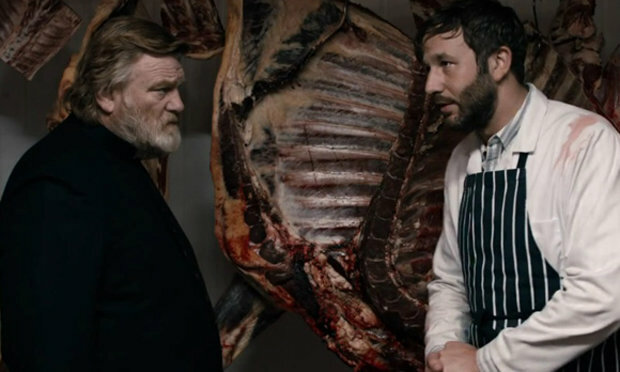 Calvary may just be one of the finest films that has ever moved me. My film aficionado friend Erik Parks featured Calvary as the top movie of 2014, even beating out some of the Oscar winners this year. I agree with him. The Irish sure know how to tell a story, especially a familiar story. I’m not sure why people are so afraid of the Gospel. When you read about Jesus, this is what we get. It’s very R-rated. It’s bloody. It’s violent. It’s poignant and challenging. As you read in the Bible within the books of Matthew, Mark, Luke, and John, you get the nitty-gritty of Jesus’ life and death and in Calvary the movie, it follows well. That is why Calvary succeeds because it doesn’t hold back from real life. Calvary may be the best movie representation of the Gospel I’ve ever seen. It is rich with symbolism as well as lines to make you contemplate and pray over. Father James Lavelle: I think there’s too much talk about sins to be honest not enough talk about virtues. Teresa: Yes. He was a good man. We had a very good life together. We loved each other very much. And now… he has gone. And that is not unfair. That is just what happened. But many people don’t live good lives. They don’t feel love. That is why it’s unfair. I feel sorry for them. Your life will be changed after watching it. My encouragement is to go see for yourself and let me know what you think. How does one acquire a copy of “Calvary?” All we have now are Red Box stations, and they would never feature this unique flick. Schu, it is available at Red Box stations in most places. It has been out for a month or so now.